PC Me if there are other/better ways to stay in touch with you. I’ll make it work. With Club Penguin now shutting down, I think it’s time I told everyone my story. Throughout the years many people in Nachos & CP Armies did this in their retirement post. But i never retired from this army in all the 8 years I’ve been here. But since I refused to retire, the only way anyone could know about me was by asking on chat. I didn’t know or care much for the internet. I just used it for school and every once in a while my best friend would show me a flash game site. One day, we were having a sleepover and I saw him playing a penguin game on a site called miniclip. His cp name was Jordan_On_23. And I was surprised to hear that it was a game where you can interact with other people around the world. You could type whatever you wanted and play games with them. That is of course until he told me you can’t cuss or say mean things. for Club Penguin. I typed in the word Guitar because I like rock music and wanted to play the guitar. Afterwards I closed my eyes and typed many random numbers, getting 48300. One day, I discovered on YouTube, that Club Penguin players made there own music videos and other videos. Some of my favorites were Portionator, Mutant444, Musian, CPBroadcast, Hartcory,Nachoz Rulez, Artic Furry, Slimz1 and last but not least: Person1233. I loved these channels so much I wanted meet all the penguins one day. I even started my own channel(MetallicaFan657), but back in 2010 I deleted some videos due to embarassment if my friends discovered my channel. But there are a few still on there if anyone is curious(If i fix my broken laptop ill reupload). I was playing Club Penguin like normal. Occasionally there would be some snowball fights at the Dojo or Snow Forts that I’d join, or I’d try to start my own. Then one day, in the Town of some server. 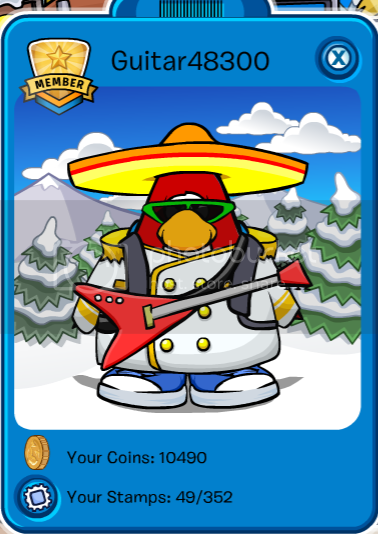 I saw Penguins in Sombreros fighting a team of green penguins. The green team was ACP and of course the sombrero penguins were The Nachos. 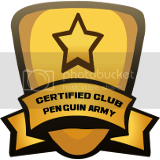 I went to ACP’s side that day because their name was Army of Club Penguin. That maybe lasted 10 minutes then both teams logged off. A couple months passed and later I discover that Person1233 was the leader of The Nachos and he had a link to their website. I clicked and instantly joined so I could meet Person. No matter what it was I was doing, I made sure to stay active with this army. the only things that got in the way were high school tennis and going to School of Rock. Whenever I had nothing else to do, I’d come by here. Though I wasn’t as chatty as some of the rest of you, once you got a topic I could chat about then we’d have a good time. As time went on I started growing attached to this place. I made so many friends and shared countless memories. The wars, doodleraces, chat mafias, chat raids and just regular chat. This place is like a second home and family for me. 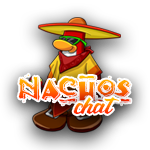 Another great memory I have was: one day I was talking to a random person about Nacho Army at the Cove(forgot what server). Then out of nowhere ACP showed up and attacked us. When I was Leader: Honestly, it was a challenge for me. I led mostly through times when Nachos were really inactive, and I couldn’t have done it without the help of another owner. But it was enjoyable being able to lead this army for a while. Favorite War/Battle: I guess I would have to say any of our wars with ACP, RPF, LT and DCP were the best because that’s when we’d sometimes make memes to mock the other army. I alway got a laugh out of them, expecially ones made by Voncheifer. Favorite Part about Nacho Army: We never gave up. We never became one of those armies that died for a while or forever. There were many times I saw this army right at death’s door, but time and time again we rose up and got back to being a powerful army. I always be proud to be a Nacho for that. About me irl: I am 21. (as of this date) My favorite things to do are play guitar, video games and lucid dreaming. Kingdom Hearts, Prototype Dead Rising and Saints Row are my favorite games. My goal in life is to become a popular rockstar who plays songs on the radio and on the big stages. 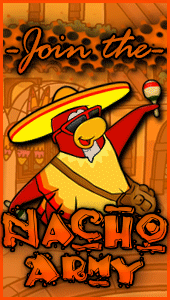 Rest in Peace Club Penguin, Rest in Peace Nacho Army. You were a big part of my life. May the Salsa Be With You all. Guitar…..Man…..It’s sad to see you put an end into this. You are the Nacho that has been the most time in the Army, and I damn respect that. You are one of the guys that I can call as friend, and especially as a father. I love you dad. Thank god I can stay in contact with you, my little rockstar. But it still is your final post and all this is coming to an end so I consider it as a retirement post. care to stay in touch? There’s multiple akabob’s which one is yours? Love ya buddy. Been there since day 1. Much respect. Thanks for the shoutout Guitar. It’s actually crazy. Everyone comes and goes, but during the 8 years that you’ve been here….well….you’ve just been here. Since 2009, you’ve seen every generation come and go and were apart of it all. It’s like having the ability to live for 300 years…crazy. And you were a really quiet dude back in the day ahahaha. Anyone else that knows with you will agree with me on this. I’m glad to spend the last week of the Nachos of Club Penguin with you.